How weird is this? In 2007, the photo that both Topps and Upper Deck used for new Dodger Luis Gonzalez show him walking with a bookbag like a student on a college campus. Topps even managed to get him on a tree-lined path - a true college staple. Perhaps there was class outside that day? 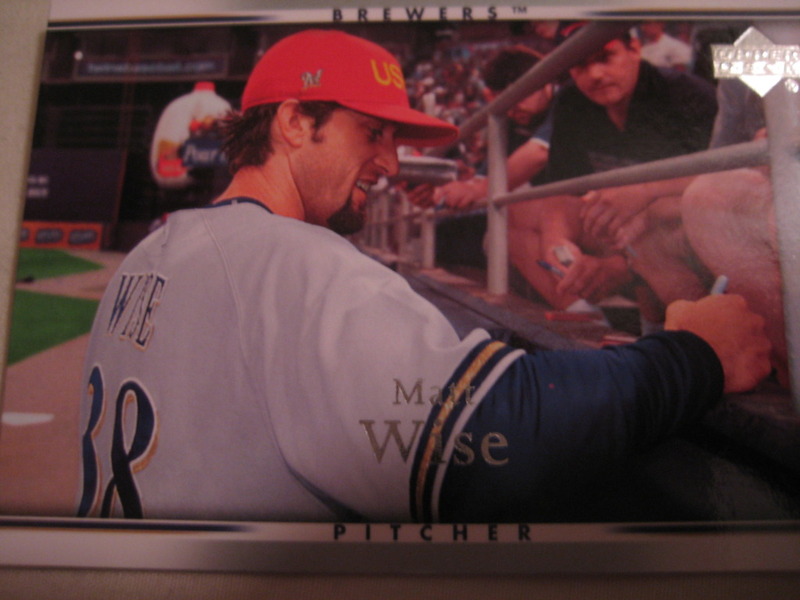 You don't see many cards with pictures taken inside of domed stadiums, which is only part of what makes this 2007 Upper Deck Matt Wise card interesting. Look behind him - was that giant milk carton always there? That's the second biggest milk carton I ever saw! 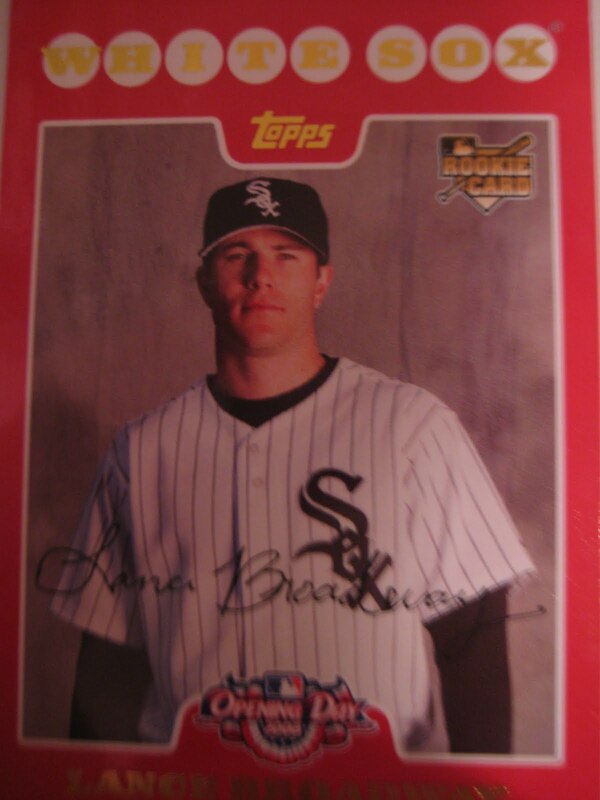 Lance Broadway was the White Sox number one pick in the 2005 draft, reaching the major leagues just two years later. Last season he pitched in the Toronto Blue Jays organization. He kindly answered my questions about baseball cards. "I'm not sure if it was for a card or just a picture. I don't remember completely but I thought it was for a Just Minors card. I was playing with Winston Salem at the time and the photographer wanted me to get on the mound and throw a ball at him as if I were pitching. I've seen the picture and it looks great but the throws before were not so much. I nearly smoked the guy a few times. I told him I didn't think it was a good idea but he insisted so i let it fly. Gotta say I was more nervous about those few throws than any other in my career.... 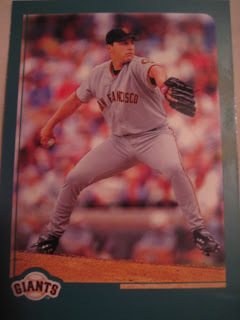 I don't really have a favorite baseball card of mine. Any that I ever had I gave away so I didn't have to look at the stats on the back! And no I don't collect cards anymore. I did as a kid but I ruined most of the ones I had." Thanks! 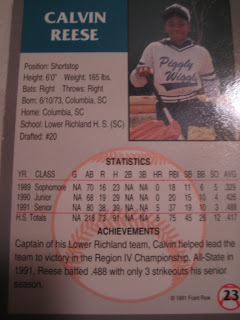 Here is his Just Minors card from Winston Salem. 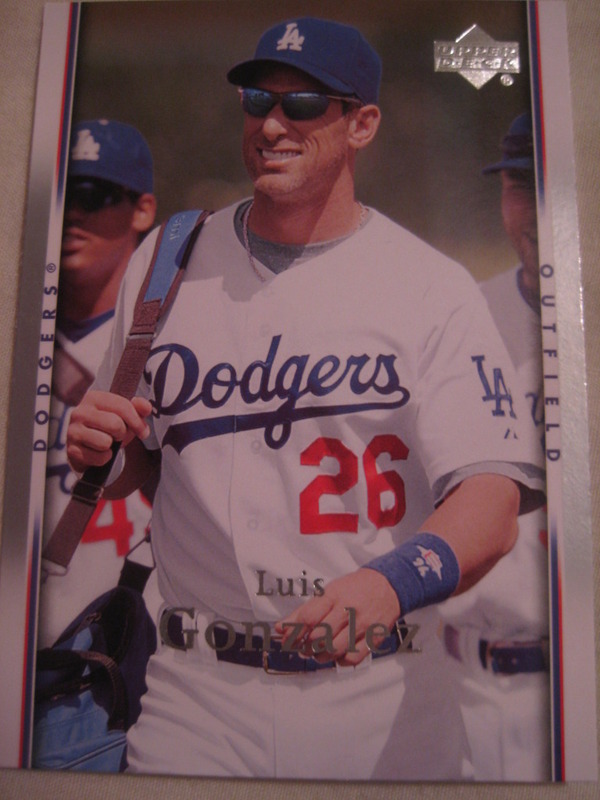 Here is the one card I have of him, from the block of 2008 Topps Opening Day cards I got in my trade with Smed. Check out the advertising behind Greensboro Hornets catcher Kiki Hernandez. Behind his left shoulder is an ad for a "Sports Cards Superstore". Too bad for the store that the picture wasn't clearer - it could have been nice free advertising for them. 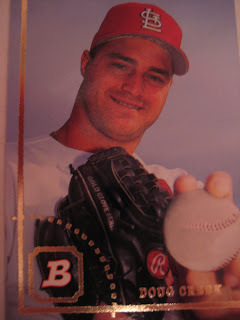 Brook Fordyce caught for ten years in the major leagues with the Mets, Reds, White Sox, Orioles and Devil Rays. 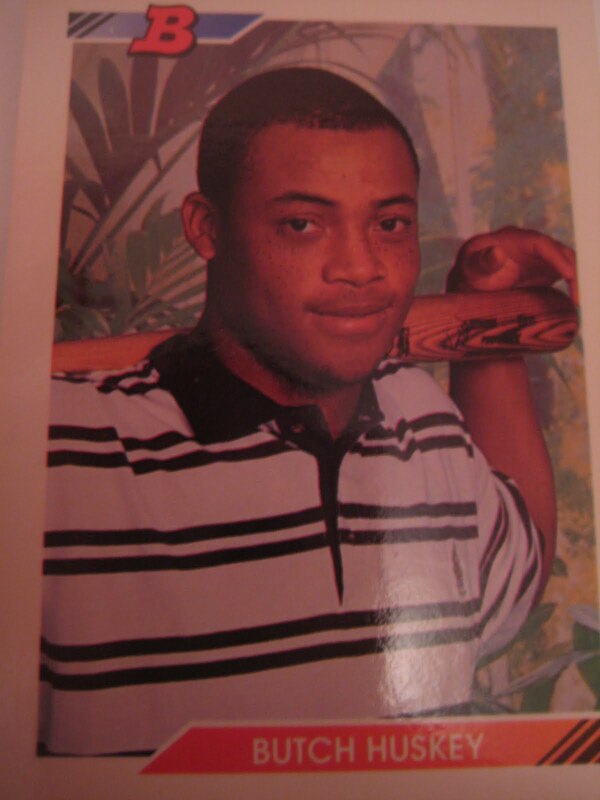 His best year was 2000, when he hit .300 with 14 homers and 49 RBI for Chicago and Baltimore. Now the Head of Instruction and Director of Player Development at All American Prospects in Stuart, FL, he kindly shared with me this baseball card story. 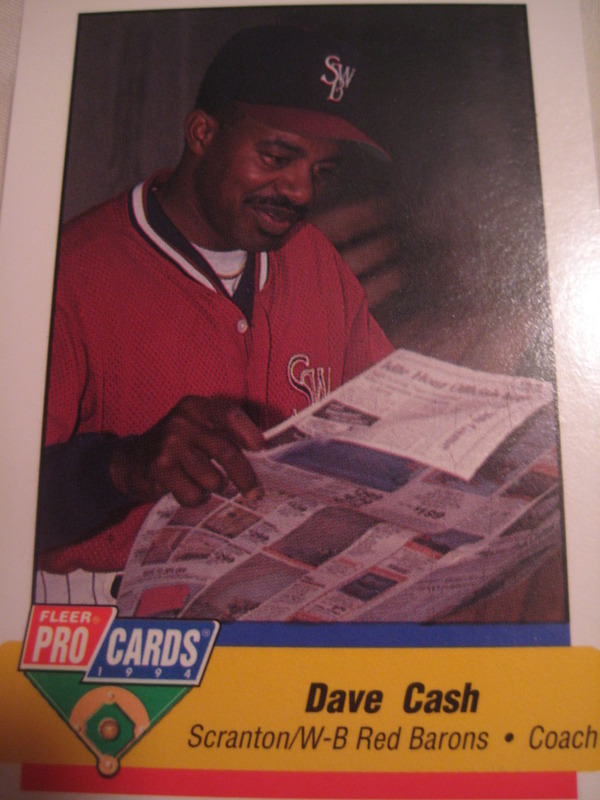 "Funniest story: 1993 in West Palm, the old Braves spring training site, a little old lady demanded me to sign her Butch Huskey card. I told her several times I was not him. She refused to believe me. 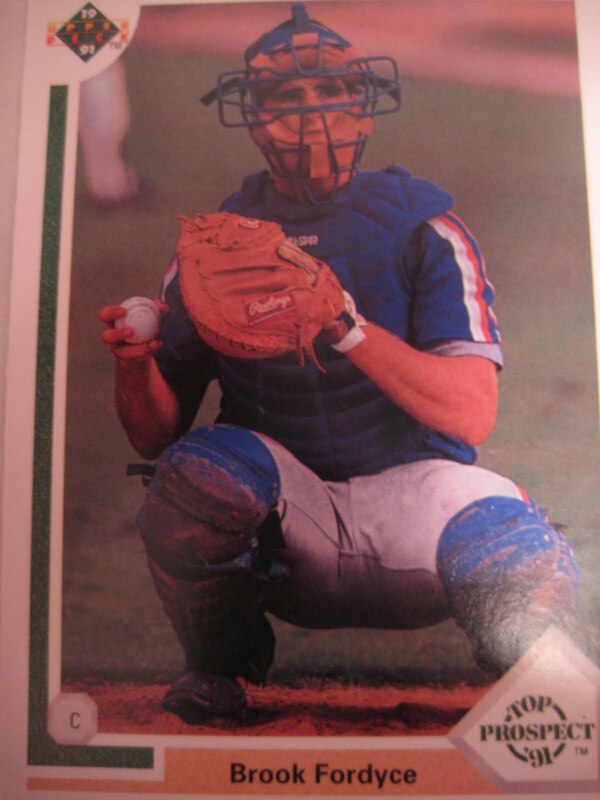 Please look at a Butch Huskey card." 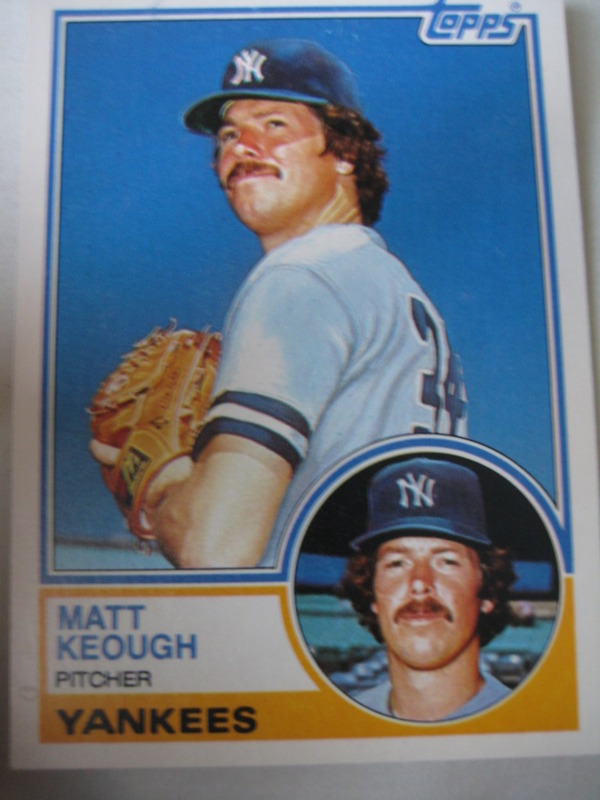 The interlocking NY can be difficult for airbrushers to pull off, as can be seen on Matt Keough's 1983 Topps Traded card. Interestingly, it was at least occasionally difficult to accomplish on the actual helmets. See Bob Geren's 1990 Leaf card, for example. Here's a close-up, where you can see that both the N and the Y are rather misshapen. I went to the Tri County Flea Market this weekend to get some card supplies. I couldn't help myself and got a whole bunch of cards too. Most of the cards fit into one of two categories - minor league cards, like this one of Hensley Meulens with his nickname "Bam Bam" on his bat knob. The other category was shiny cards - I was particularly dazzled by these two. It's fun taking their picture, trying to capture as much colored light as possible when taking the picture. Vance Wilson caught for the Mets and Tigers for eight years, from 1999 to 2006. Now the manager of the Royals Class A team, the Kane County Cougars, he kindly shared with me some great baseball card stories. 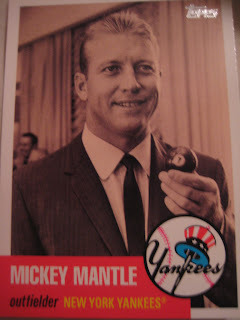 "One story about a card of mine is when I got traded to Detroit, the card companies came to shoot their photos. 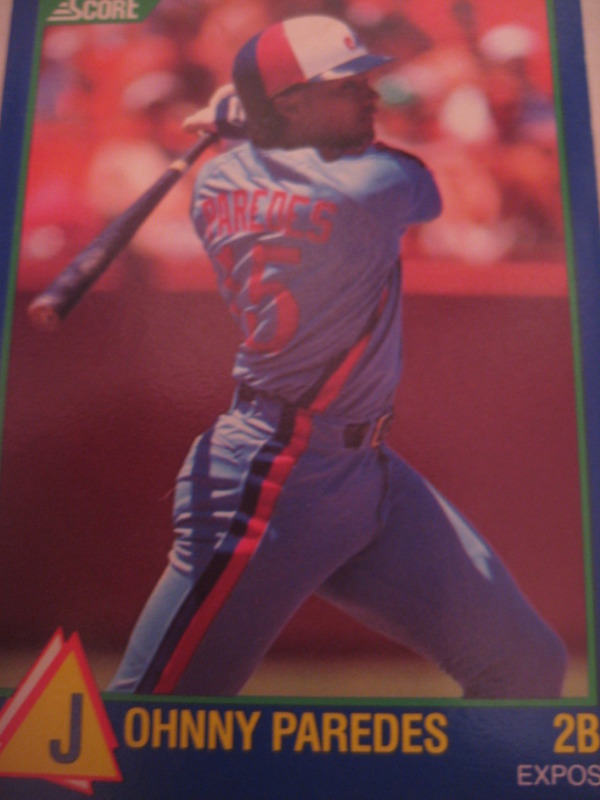 Donruss shot a picture of me standing under an awning with a palm tree and some other shrubbery behind me. When I commented that that was a pretty bad background for a major league baseball player's card the photographer assured me that they were going to superimpose an old timey stadium as the background. 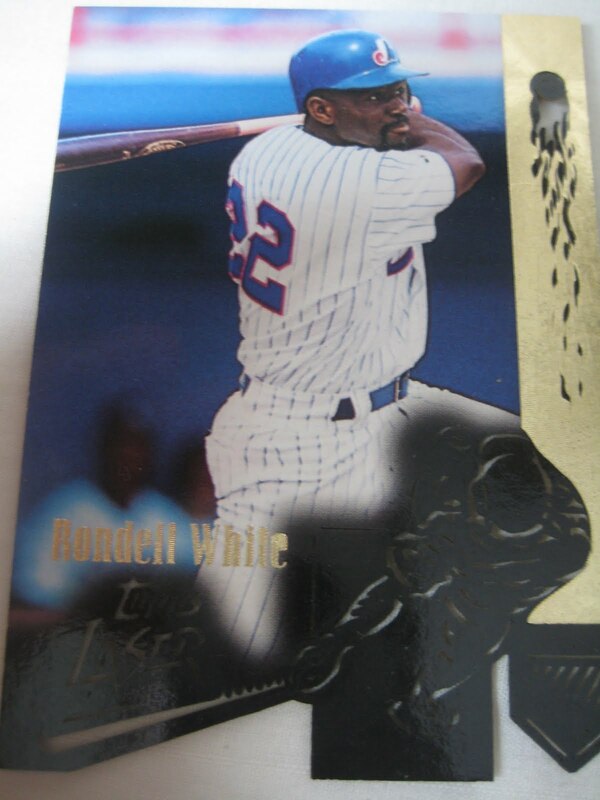 Sure enough, when the card was released it was a staged pose of me with nice shady shrubbery behind me, standing under the minor league cafeteria awning. 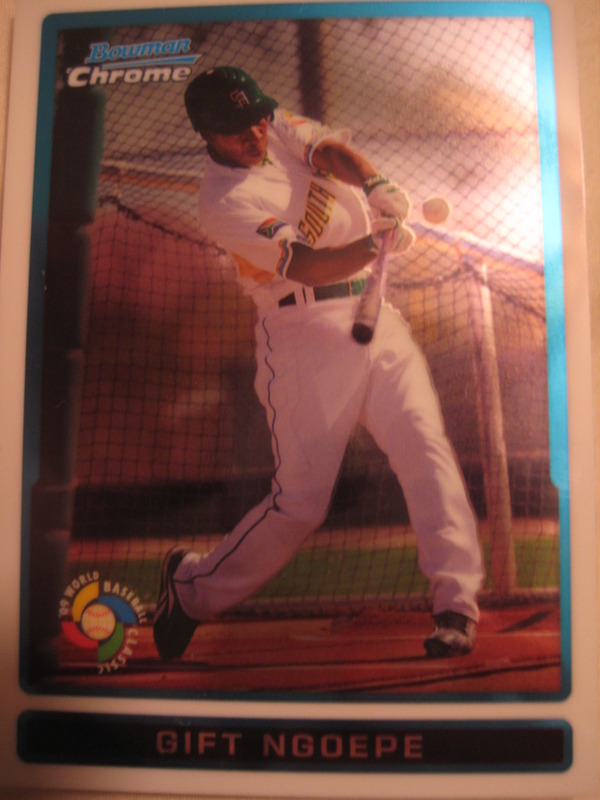 2005 Donruss Team Heroes #203. 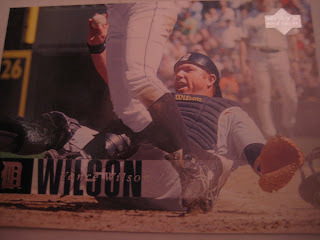 My favorite card of myself was an Upper Deck card of me on the ground after a collision with Ichiro. What made it great was the play; an awesome play by our leftfielder to cut the ball off, our shortstop made an unbelievable relay and I had to pick the ball and block the plate as Ichiro came in with a slide/elbow to the face. He was out and the card has cemented that all-around great play in my memory. Upper Deck 2006 #610. The only cards I collect are of players that I have played with. I collect them so my wife can craft things with them for our game room. She will soon be covering the game room door with cards of all my old teammates." 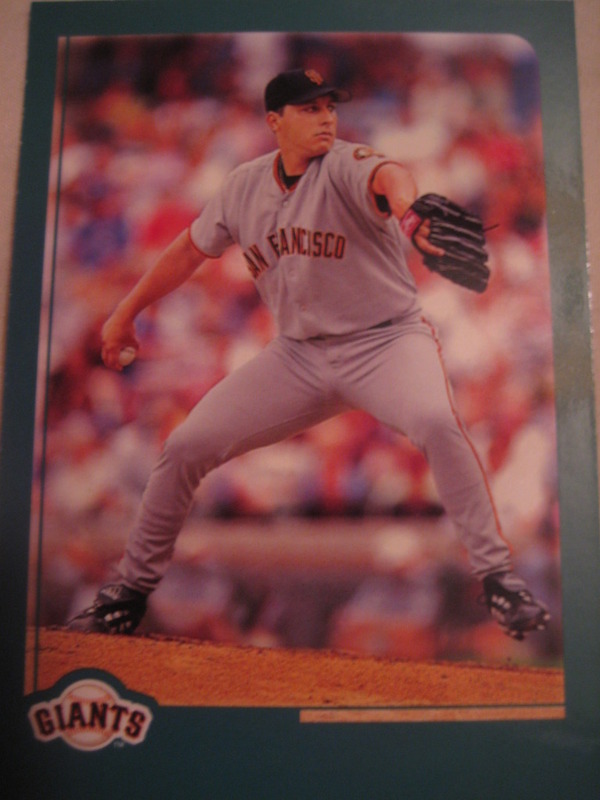 Chris Pinder pitched for four seasons in the Orioles and Indians organizations, compiling a 16-14 record with 13 saves and a 3.23 ERA before injuries ended his career. Now a medical device salesman and the President of Big League Keychains, which makes keychains out of actual baseballs, he kindly answered my questions about baseball cards. "Ha well nothing real funny or crazy like our 2nd baseman Billy Rip....but I would grab a bat and stand there and then I would go right-handed when I was a lefty....nothing crazy... I was once another player when we got our cards. 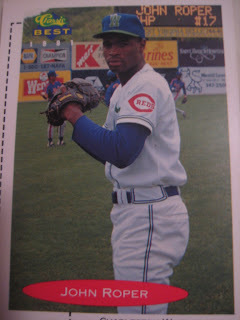 That would have been 1988 Hagerstown Suns..... 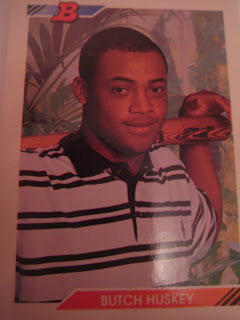 I do not collect...I have baseballs and some pictures and bats... 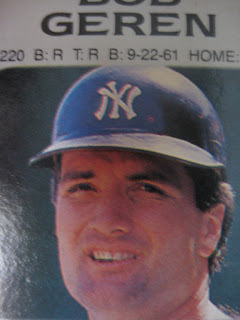 I do have a full set of 1990 Topps MLB... How much is that worth?" 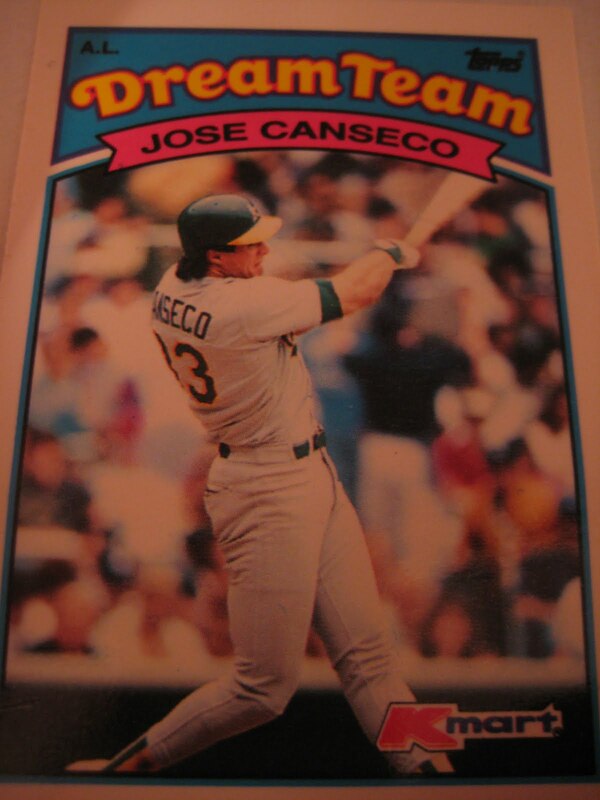 As for 1990 Topps, according to Wrigley Wax, the average price on ebay is around $10. 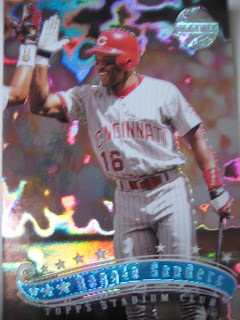 Here's an interesting card I got from Smed - it's something called "Topps Laser". Not only is the card die cut on the bottom and near the right top corner, but there are "burn marks" everywhere the "laser" cut the card. 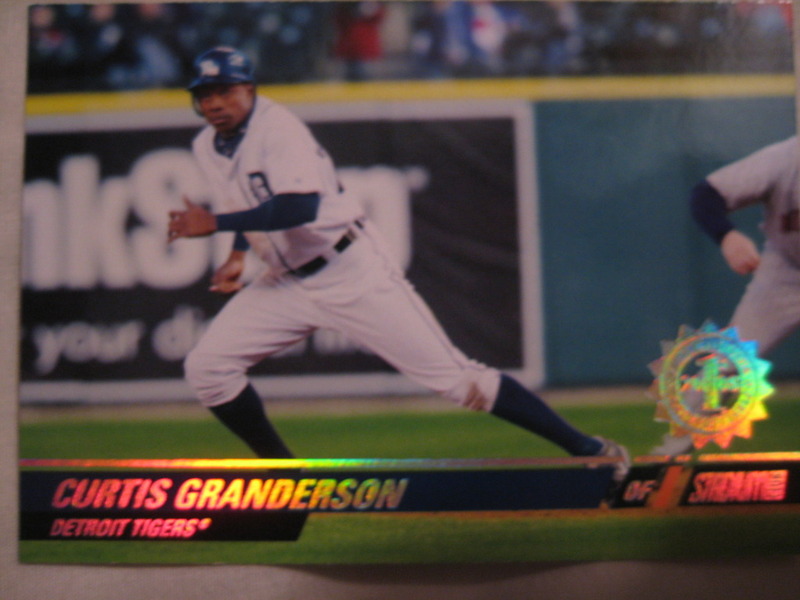 It's pretty cool but every time I pick up the card I feel like I'm going to mess up that border. 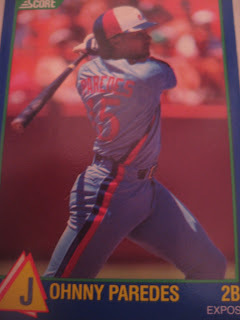 Included in the various oddball cards Smed sent me were a bunch from 1989 Kmart. I already had most of the 33 card set, but his big batch enabled me to finish it off with cards like the Canseco below. If anyone needs any cards from this set, let me know as I have a lot of duplicates. One of the interesting sets represented in the trade from Smed was something called the "Mickey Mantle Story." Here are two interesting photo choices from this set. 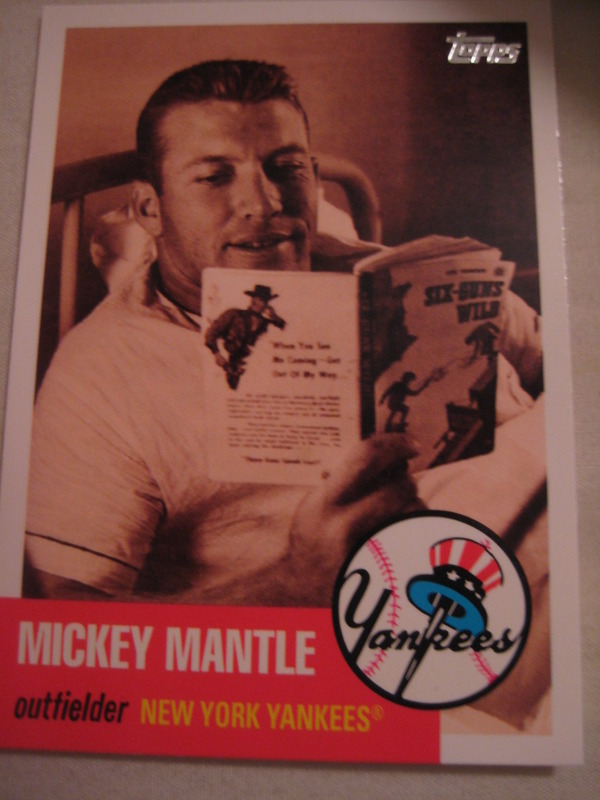 Here is The Mick reading a western novel in bed - "Six-Guns Wild." The back caption says - "When you see me coming, get out of my way." Presumably this was a publicity shot as he recovered from one of his numerous injuries. Here's a picture of him at a pool hall, back when those places were considered quite unseemly because of their association with gambling. Mantle was actually suspended from baseball for a couple of years in the 1980s for working as a casino greeter. Red Sox blogger Section 36 is giving away his 2001 cards, team by team. It's still going on, so if you want some free cards check it out. Since the Yankees were taken, I kind of randomly chose the Pirates. 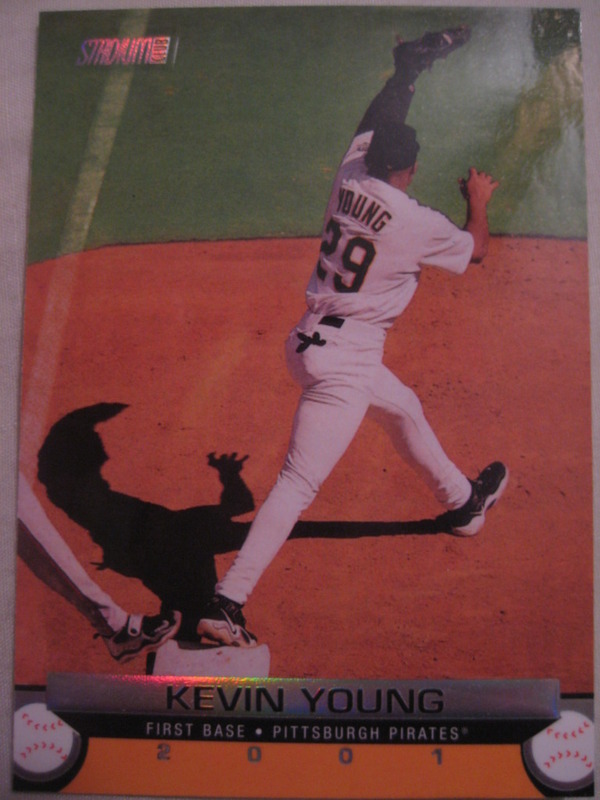 I got a lot of cool cards, like this neat action shot of Kevin Young. 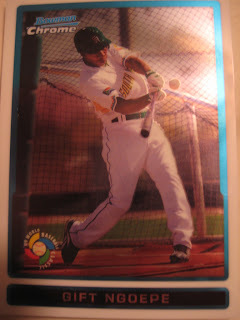 But on the back, the gold foil of Pablo Ozuna! Smed and I recently completed a monster trade, with literally thousands of cards changing hands. About half of what I got was cards from the last few years, like 2007 Upper Deck and 2008 Stadium Club, sets that I previously had very few of. The other half consisted minor league, oddball, and other random stuff - my favorite! Here are just a few examples. Here's a Great Sports Name for you - South African baseball star Gift Ngoepe. 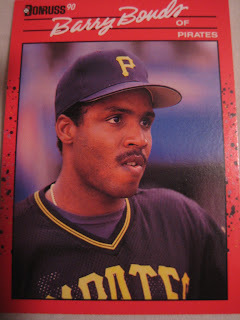 He has since become South Africa's gift to the Pittsburgh Pirates organization. 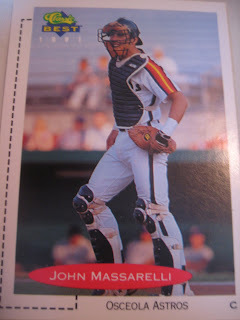 Front Row was an early 90s minor league set that featured the players in their little league uniforms on the reverse. 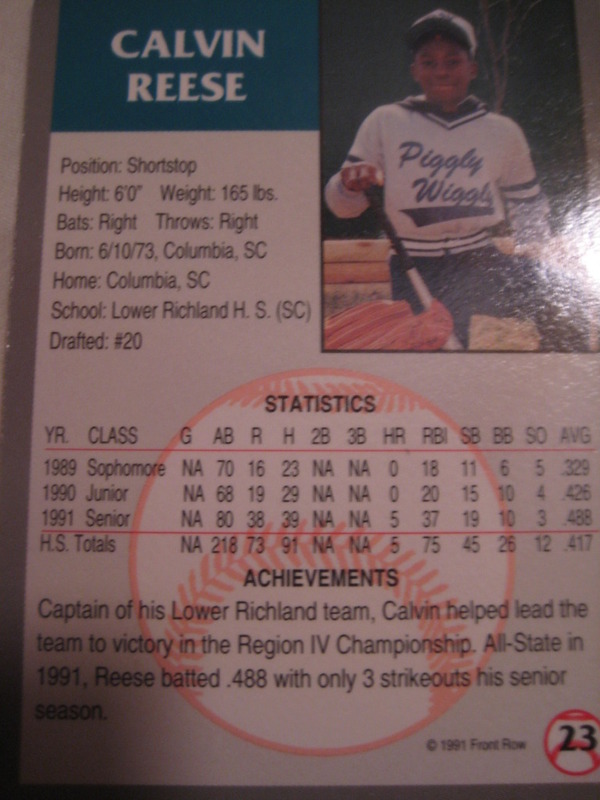 Here's Calvin "Pokey" Reese in his "Piggly Wiggly" uniform. Apparently Piggly Wiggly is a grocery store in the Midwest. 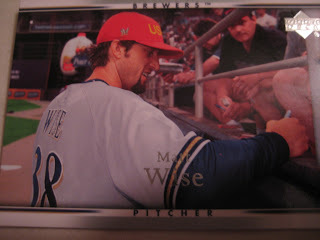 Finally, here is a sampling of some of the more interesting and fun minor league cards. I'll be posting other cards from this trade in their own separate posts. Thanks, Smed! 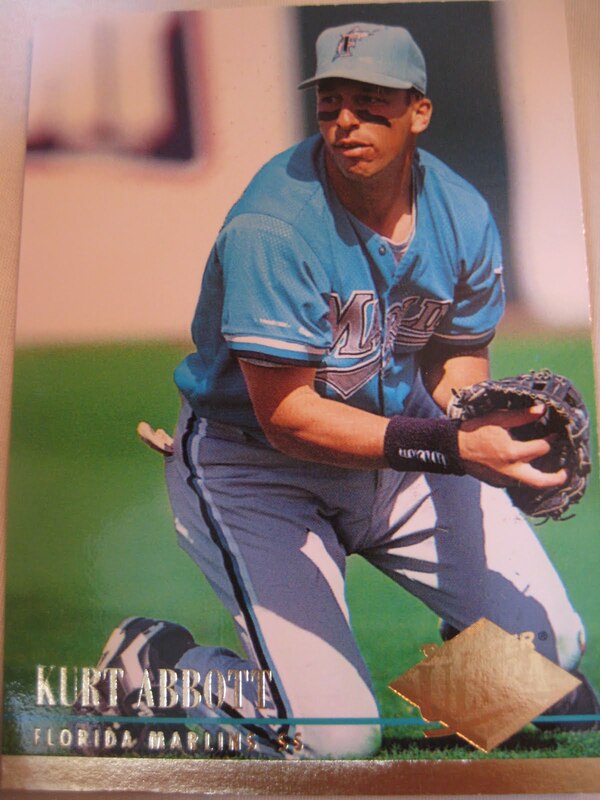 "1994 Ultra Fleer Kurt Abbot card is really an action picture of me with the Florida Marlins." Thanks! As you can see, that is clearly Massarelli and not Abbott. (You can see Massarelli's photo on either link above). Here is an actual card of Massarelli, from 1991 Classic Best, acquired in my recent trade with Smed. 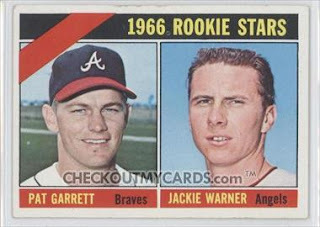 Adrian "Smokey" Garrett played eight seasons in the major leagues for the Braves, Cubs, A's and Angels. 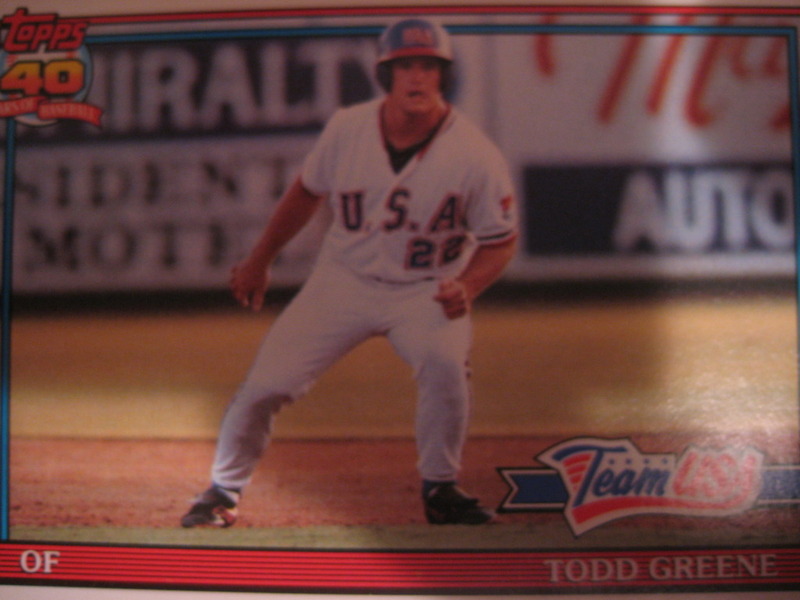 Now the hitting coach for the Louisville Bats, AAA affiliate of the Reds, he kindly answered my questions about baseball cards. "The only card story I have is, on my 2nd card is the photo of me and Jackie Warner, and it has the name Pat Garrett. 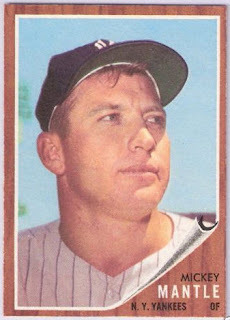 Cy Berger, our Topps man, and I might say a great man, and friend to all players, always called me Pat, in reference to the man that shot Billy The Kid. He was the only one that ever called me that, and he used it on that card, and only that card. I don't know why, he just did. 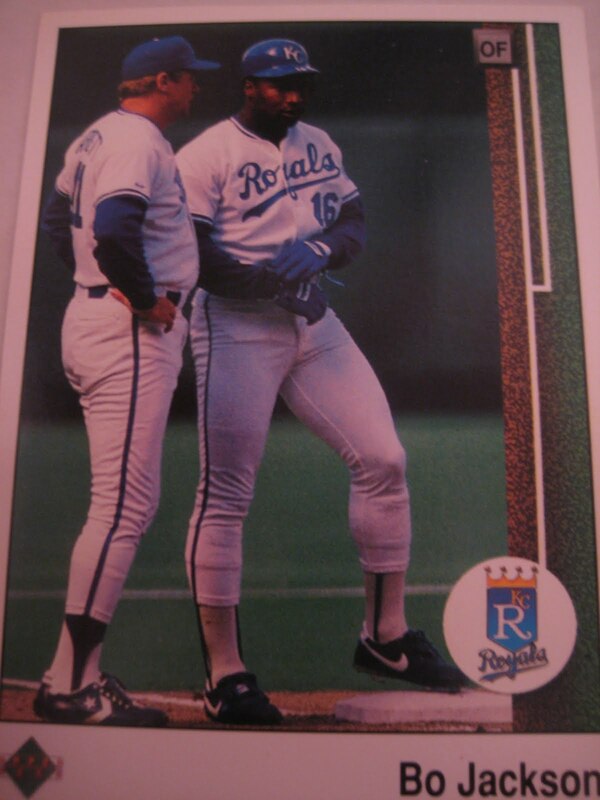 My favorite card is not of me, but of Bo Jackson, it was put out by Upper Deck, and on the back of the card is a picture of Bo with me on 3rd base, when I was the 3rd base coach with the Royals. I collected cards when I was a kid, and had a lot of great cards, but I don't know what happened to them, when I moved away from home my Mom probably packed them away some where, or gave them away. They may be in the attic at home, I don't know. I don't collect cards anymore." Thanks! Here is a card of his from my collection. 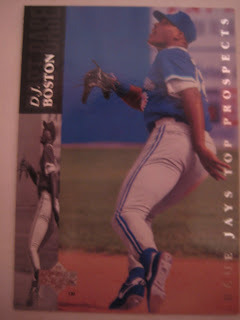 DJ Boston played in the Blue Jays, Pirates, A's and Rockies organizations from 1991 to 1998. Now the hitting coach for the Danville Braves of the Appalachian League, he kindly answered my questions about baseball cards. 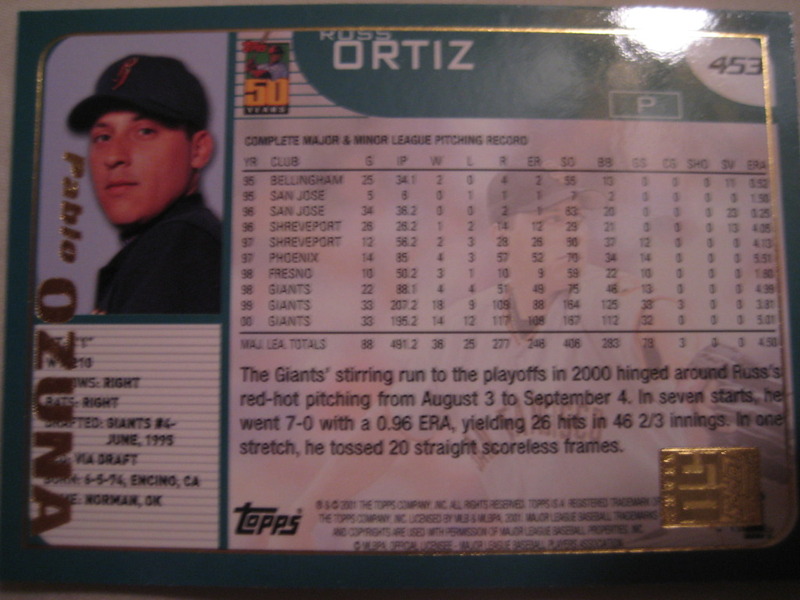 - Do you have any stories about cards of yourself or of other players? There was a time when I asked the camera guy who was there to take my pictures why he was taking pictures of me bunting! I am 6'7" lol. Then he used the picture for print. - Do you have a favorite card of yourself or of another player? I just like all of the action cards during the games. 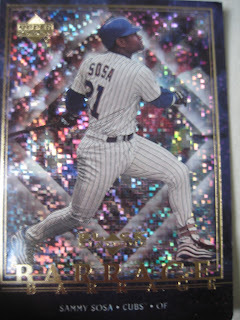 - Do you collect baseball cards? hid somewhere at my parents house. 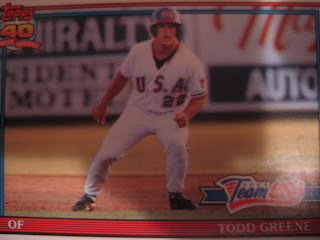 Todd Greene played eleven years in the major leagues for six teams, and played in the 2001 World Series for the Yankees. Now a scout for the Diamondbacks, he kindly answered my questions about baseball cards. "I did collect cards when I was a kid. I still have my collection. 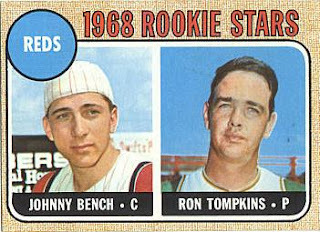 My favorite cards I have are a 1962 Mickey Mantle, and Nolan Ryan and Johnny Bench's rookie cards. I was and I'm still a big baseball fan. 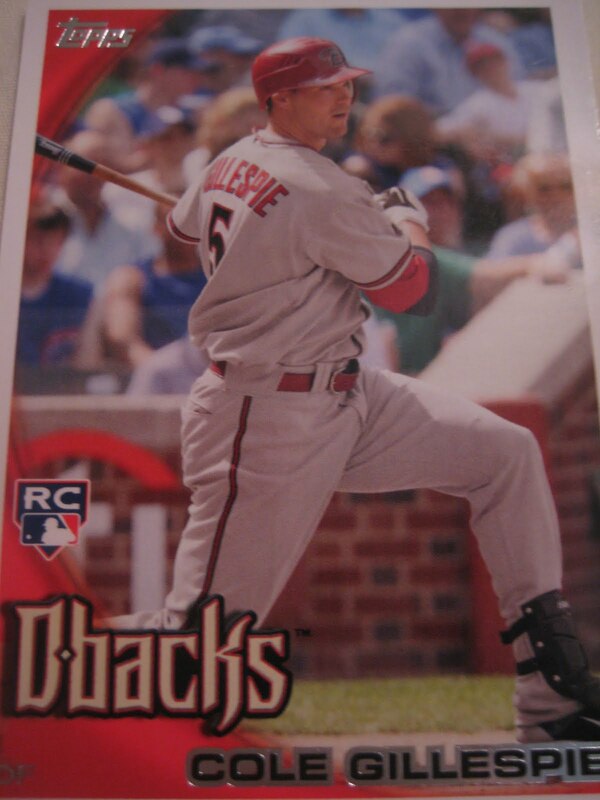 My favorite cards of myself are the USA team card, and the card I'm on with Ken Griffey, Jr."
The Brewers 3rd round draft pick in 2006, Cole Gillespie made his major league debut in 2010 for Arizona, doubling in his first major league at-bat. He kindly answered my questions about baseball cards. 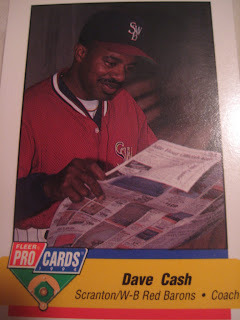 "I collected cards when I was younger but never got too into it. Barry Bonds was my favorite player growing up so I tried to get as many cards of him as possible. 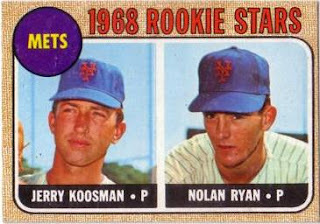 I don't collect cards anymore." Thanks! Here is a picture of his card from 2010 Topps Update. Incidentally, the Barry Bonds card pictured here came from a huge trade with Smed - much more on that coming soon! 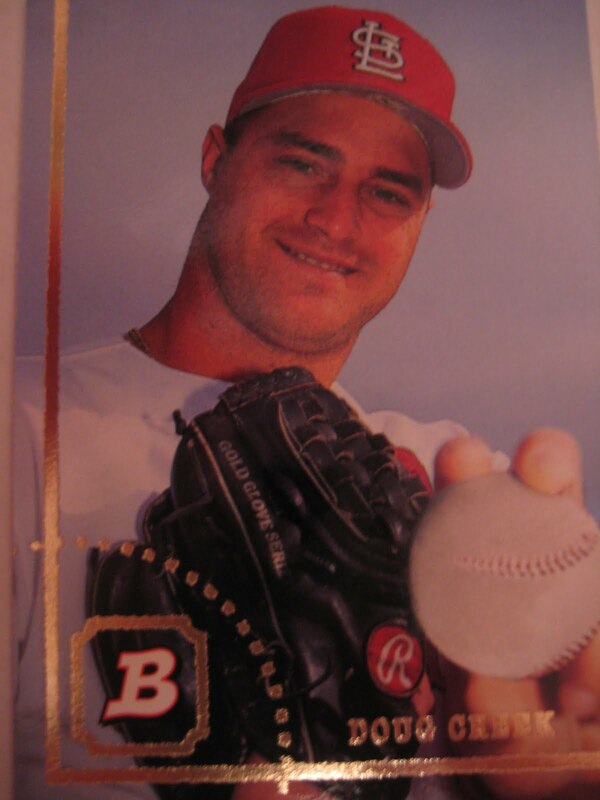 Doug Creek pitched nine years in the major leagues for the Cardinals, Giants, Cubs, Devil Rays, Blue Jays, Mariners and Tigers. Since his retirement from baseball, he has become a pro angler, finishing 4th in the 2007 Jim Beam Tarpon Cup. 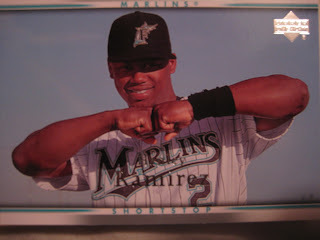 He also runs chartered guided fishing trips and is a private baseball instructor in Fort Myers. He kindly answered my questions about baseball cards. 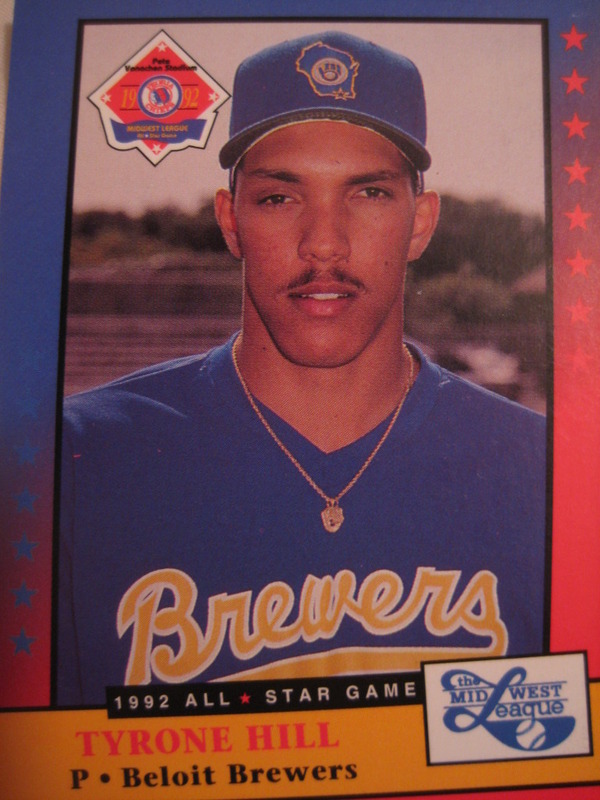 "Although I am a former player, I do not nor ever have collected baseball cards. I have saved a small collection of my own likeness cards for my children and grandchildren, but never had any interest myself." 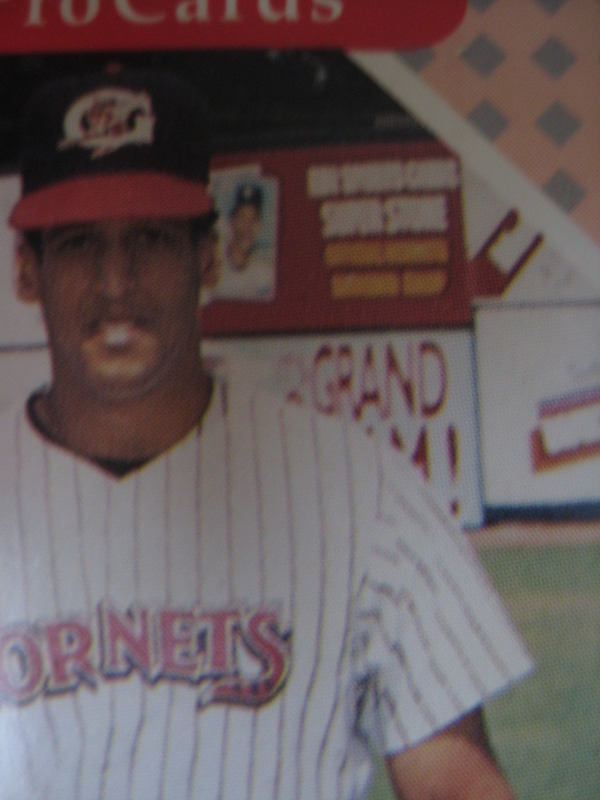 Jason Friedman played in the Red Sox, Mariners and Orioles organizations, reaching the AAA level in each system. 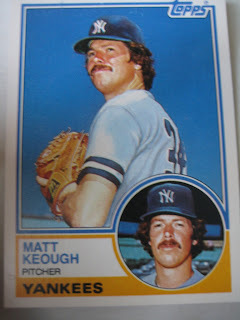 Now a partner at the law firm Ford Walker Haggerty & Behar in Long Beach, CA, where he specializes in professional and product liability, he kindly answered my questions about baseball cards. "- The cards of me with a bat show me right handed but I hit left handed. 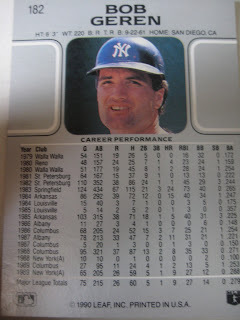 - The Fleer Excel card is my favorite. - I don't collect cards. I did when I was younger and I got a full set for the year my son was born." "I don't have any stories or any favorite baseball cards, because I gave away all of them." 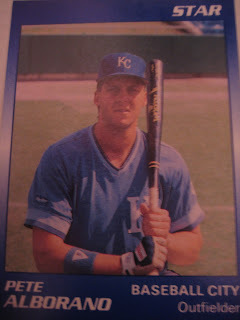 Pete Alborano played seven seasons in the Royals and Phillies organizations. 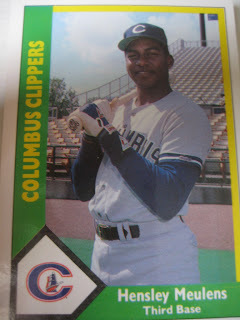 His best year was 1989, when he hit .337 with 6 triples in 77 games for Baseball City. Now a sheriff in the Nassau County Police Department, he kindly answered my questions about baseball cards. 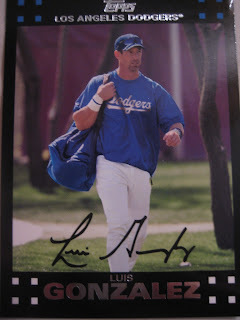 "I have many fond memories of my career and pro ball, however most recently I have noticed some real low lifes asking me for my autograph because they are "big fans" and they want to add my name to their collection. It turns out, with some research on my part, these so called"fans" are not fans at all but are actually selling my cards at a nice profit, some upwards of 8 dollars a card...not bad for a 25 cent card ,huh? I think it's disgraceful and its people like this that spoil it for good loyal people like yourself. 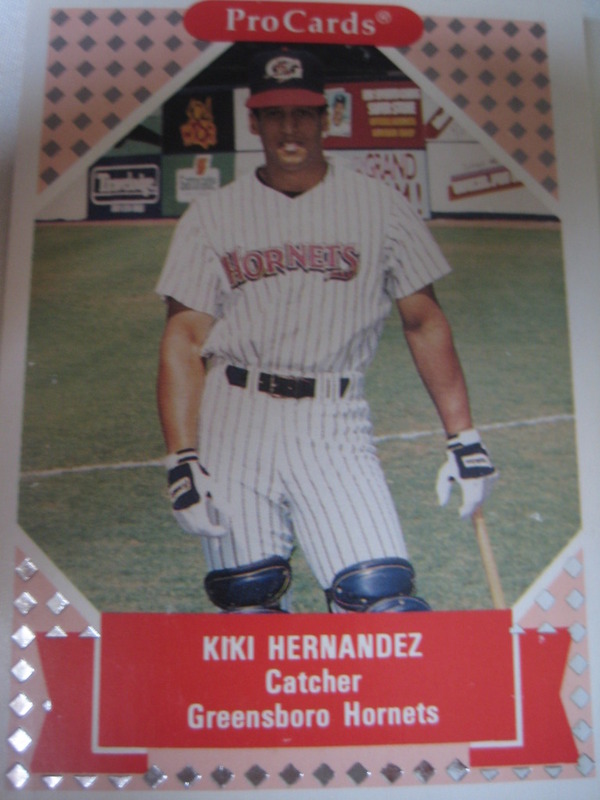 To answer your other questions, I do not collect cards, and I do have a favorite of myself...it was a 1992 Skybox card pre rookie (Fleer) Reading Phillies...I wasn't able to obtain many of these and still can't find them...if you find any I would appreciate any help." Thanks! 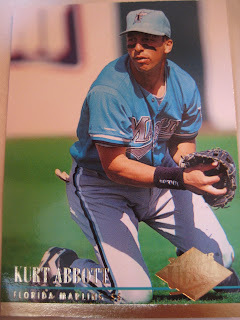 I couldn't find a picture of the 1992 card, so here is the one Alborano card I have, from 1989 Star. I actually have two of these, so I'm going to offer him one. If you have any extra cards of his, let me know and I'll see if he wants it. Please Read This Post. Thanks. Great (and mostly not so great) Cards (and other stuff to).